Chevy brought back the classic nameplate for the 2019 model year, attaching it to yet another crossover with Camaro styling (which honestly doesn’t look bad), and sticking it in their already full lineup. According to their own site, it sits above the Equinox, but below the Traverse, but with pricing and dimensions that overlaps both on multiple trim levels, which makes you wonder, why? (more on that later). There are 5 trim levels to choose from :L, weirdly named Blazer 2.5 Cloth and 3.6 Cloth, RS and Premier. For the sake of the breakdown I’ll just go over pricing for the Cloth trims, RS and Premier. AWD is also available, but only with the V6 of course. L is bargain basement, Hertz level trim and starts at $30 grand. For that price you get a 2.5 I4 with 193 horses paired to a 9 speed auto with start/stop, remote start, 8 inch touchscreen with Android Auto and Apple Carplay...and pretty much all the basic cloth, manual powered stuff you’d expect a crossover to come with now a days. Its best to skip this trim unless you want to keep your payment low. The next 2 trims, the Cloth Trims, I see as being the bulk of the sales since they aren’t quite base, but are far enough from the other 2 trims to where they aren’t too fancy, and could be good for people that want popular features standard. The main differences between the 2 are the engines and getting the 4 or the V6. There’s a grand difference between the two. Sunlit Bronze Metallic; Red Hot; Nightfall Gray Metallic; Silver Ice Metallic; Summit White; Black; Graphite Metallic; Oakwood Metallic. The extra charge colors are Kinetic Blue Metallic, which is $395 and Cajun Red Tintcoat, which is $495, which is the red Chevy originally showed us. I choose Black of course. There are only 2 interior cloth choices, gray and black. Nothing special. Honestly all of this could have been included as standard. And for some reason says “May require additional optional equipment”. Whatever that means. Well, honestly, those are the main option packages. The other 5 are mainly cargo management packages and one first aid kit package ranging from $130-$315 bucks. I choose the convenience package. Exterior options wise there are quite a few. There are optional 20’ Black wheels for $2 grand; an engine block heater for $100 for all you cold climate people, and 11 exterior enhancement options ranging from roof rails, to Black emblems and bowties to illuminated Bow ties. I choose the Black wheels for 2 grand, body color grill bar for $395, and I tried to select all the Black emblems, which are individual and will turn the bow tie and Blazer letters Black, but you can’t select them all. Chevy only lets you do one at a time, so I choose the Black Blazer lettering for $115, which is dumb. There are 18 interior options with the bulk of them being things like tablet holders, floor mats, cargo liners etc. The main options are rear seat infotainment systems, one with a dvd player and one without with $245 difference separating the 2. Aside from the 47 other accessories, with the options I selected, this otherwise “basic” midrange Blazer is nearly $40 grand; $38,450 to be exact; $37,845 with the same options on the 2.5 Cloth; $41,150 with the 3.6 and AWD; Which is..a lot for what this is. And we aren’t even to the other 2 trims yet. The next trim up after the 3.6 Leather, is the looker of the bunch, the RS. Starting at $44,695, it comes standard with the 3.6 and AWD, along with black accent trim, grill and black bow ties, 20’ unique wheels and red interior accents. You can also get it in nearly all the exterior color options as well. There’s only one interior color choice with all of them, black perforated leather seats. RS Interior. Camaro-like. Except for the Chevy Truck wheel. Pricey for sure. I choose both of these packages. On this trim as well, you can choose the illuminated emblem as well since all the other emblems are Black. I chose this for $395. All in, you’re looking at an eye watering $51,150 for a Blazer RS. At this price, there are way better options that are actually, you know, fast and don’t just look the part. Lastly, at the top of the trim heap, is the luxury lined, senior targeted ( you know they are going to be the ones driving this thing) Premier. It starts at $46,795. It mainly comes with luxury trim pieces, i.e. bright chrome trim and body color pieces. Interior wise this trim seems the availability of maple sugar leather on certain colors and wood trim. I stayed with the black exterior color to choose this color. It’s a no cost option as well. With the same options as the other trims, a Premier trim is $51,650, which again, is pricey. A no optioned Blazer RS and no optioned Traverse RS is only a $2,200 difference. You have to work a little bit to get the Equinox to that level and there is no comparable RS trim. Once you get to the Premier trims, there’s a $2,800 difference between the Blazer Premier and Traverse Premier, but damn near $10 grand between the Equinox Premier and Blazer Premier. There are a few difference too however. Aside from the 3rd row option on the Traverse you can’t get on the other 2, you can’t get a the 3.6 on the Equinox anymore, which only has the turbo 4 and the diesel, and you can only get the turbo 4 on the Traverse on the RS trim with FWD. Also once you get to the High Country trim on the Traverse, it starts to head towards lower end Tahoe trims price wise. Inside, the gap closes between the 3 with passenger room being so close it makes you wonder why they have 3 different vehicles this close interior wise: There’s a 1.2 in difference in second row leg room for instance between the Blazer and Traverse, with the Blazer actually having more legroom at 39.6 vs the Traverse’s 38.4; it gets even dumber between the Equinox and Blazer, with a 0.3 in difference between the two with the Equinox having the advantage over the Blazer at 39.9 to the Blazer’s 39.6. The numbers don’t lie. These vehicles don’t make sense when you delve into the numbers. But there you have it. 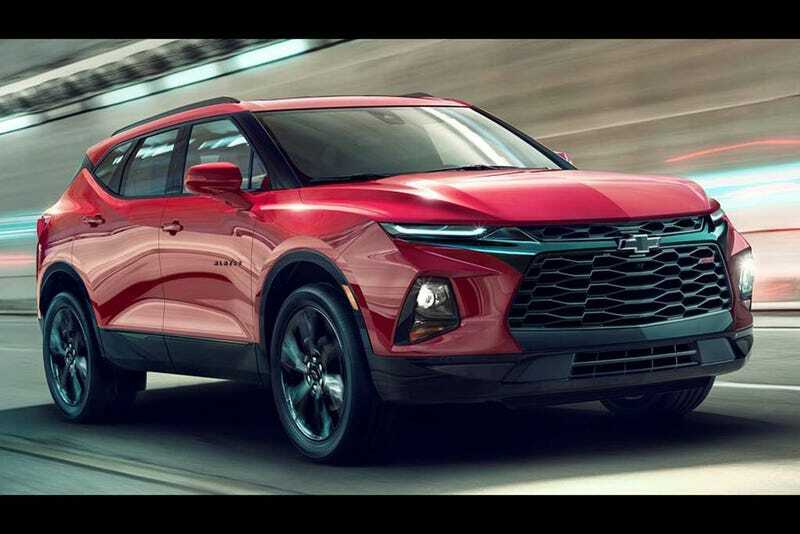 Yet another crossover from Chevy in a field of crowded crossovers that that is a looker, but isn’t cheap, and makes you wonder why it (and others) exists at all when you look at the numbers. What do you guys think of it?